I figured I would be buying a few issues of these Guardians of the Galaxy spinoff titles but I wasn’t expecting to be buying a first issue, that’s pretty quick. I’m surprised that CM Punk is using his wrestling monikers. I recall reading an article, way back in the day, that whenever Dwayne Johnson is credited as “The Rock” that Vince McMahon gets a cut of some of the movie’s revenue. CM Punk, retired, and isn’t associated with WWE – at all – so I’m not even sure how that works. He probably has been using “CM Punk” for the past fifteen years. Like most of the Guardians, I don’t really have much connection to them, until Bendis started writing the title. Which I know annoys the Abnett Lanning crowd. Batista, another WWE wrestler, did a great job portraying the character, in the film – as far as I know. I know Drax isn’t that dumb of a character, but it felt right. Issue opens with the Guardians fighting some aliens, which is how I imagine I’m going to get treated to these issues. 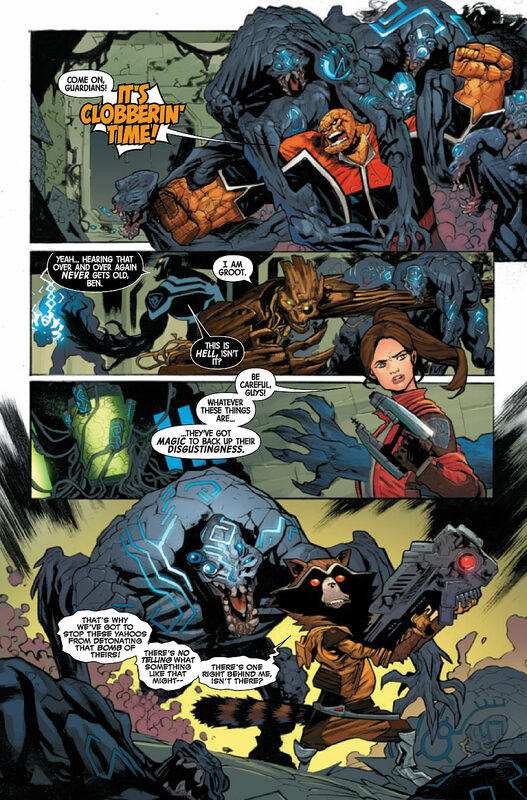 The entire creative team does a great job of handling the new Star Lord, Kitty Pryde. I do like how, in eight months, Agent Venom is already tired of hearing Ben Grimm shout “It’s Clobbering Time!” Makes me wonder how much Johnny Storm got tired of it. But, if he didn’t say it, I’m sure the members of the Fantastic Four would either miss it or wonder why he didn’t say it. Groot’s “I am Groot” quickly followed by Flash’s “This is hell, isn’t it” must be how television characters feel when they are surrounded by multiple other characters, that have catch phrases. 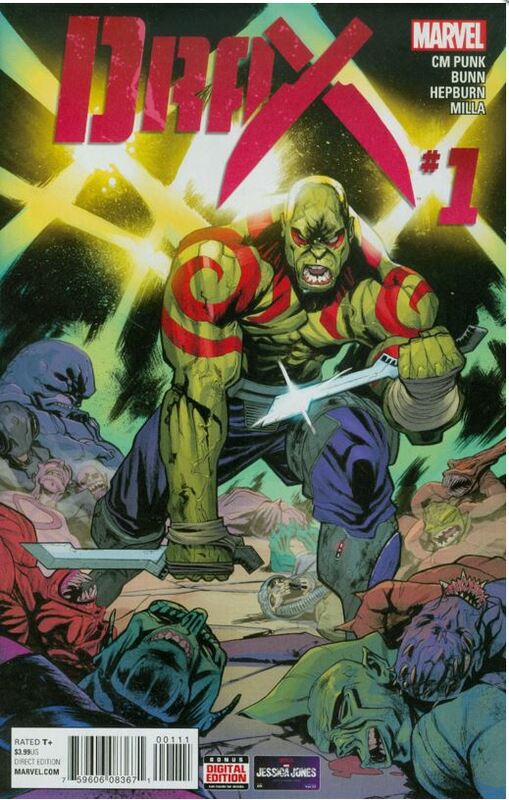 Rocket is about to ambushed, and with a page turn, we get what will most likely be the tone for this title – Drax just rips the alien in two. Blood and entrails scatter about the room. Which isn’t what I read comics for but I know there is an audience for it. Rocket brings up the great point, about how blood is hard to get out of fur. The Guardians are there, to prevent a bomb from exploding. 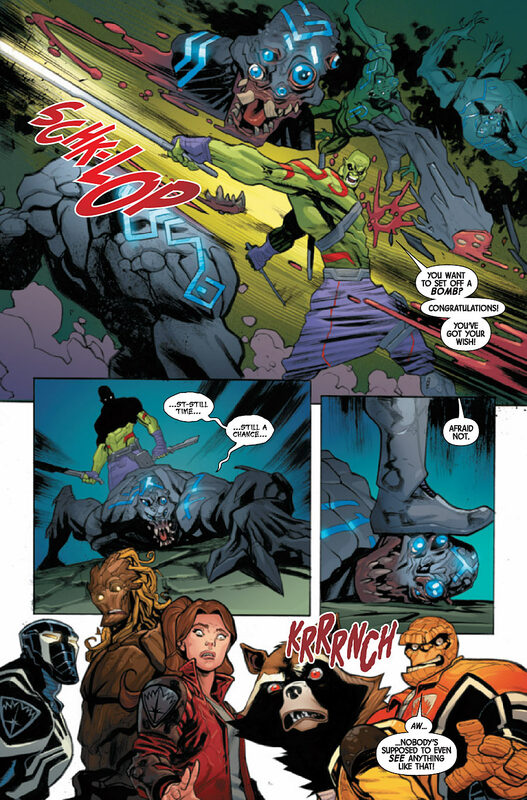 The rest of the aliens turn to Drax, as he is permanently taking out their elk, and he starts tearing into them, as well. Look at the disgust on the faces of his fellow teammates! They get to the bomb, Rocket and Groot know a place where they can dismantle it. We get the scene that makes me wonder if the Guardians are spread too thin. Like the logistics are throwing me off. Will their main title, be only for the big adventures that forces them to come back as a team? Which makes sense but does that mean some of them, won’t make it to the big adventure? Or will their main title have to have throw away lines regarding their solo titles? Grimm and Venom are going to get a drink from a space station that has Irish liquor, proving how much influence Earthlings are having in outer space. Kitty just gives the “until next time,” leaving Drax without a friend. 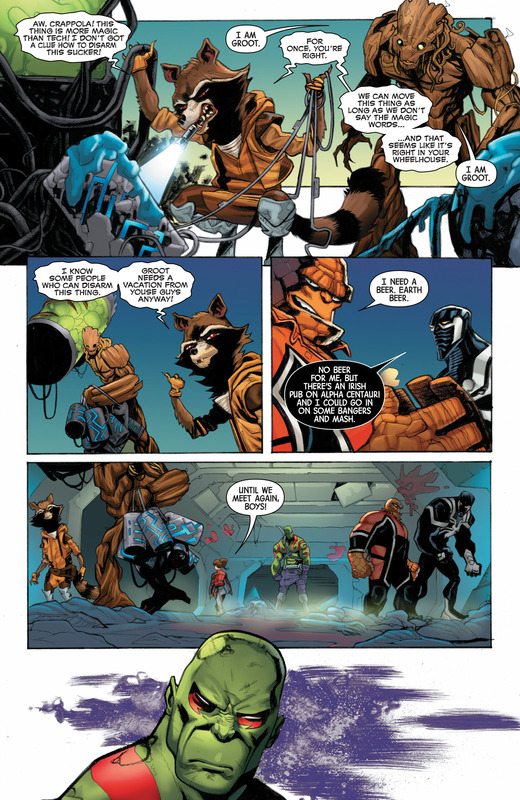 Not hearing what Kitty is up to, Drax tries to join her with her plans. She is doing “girl stuff” which makes me realize that she’s the only member that doesn’t have a solo title announced. That seems sexist to me, but also, she’s the best character of the batch, so it makes some sense to keep her isolated to the big title and guest appearances in the spin off titles. Now that I wrote that, Grimm doesn’t have a solo title, so maybe racist is the term to throw about? Probably more a Bendis call than scheduling, but who knows. Grimm and Thompson’s side ship doesn’t have room for a third, so Drax can’t join them. 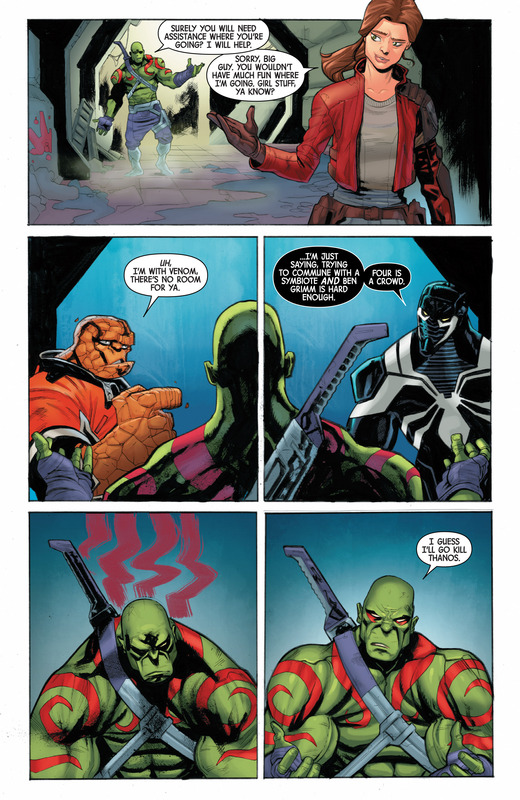 Drax, defaulting to his main goal – decides he will go kill Thanos. Rocket is going to lend Drax a barely functioning spaceship. Whiling flying, who knows if he even knows where to start looking for Thanos – another ship tries to board his ship. They see that the ship is barely held together by string, so they keep flying away. The ship starts falling apart so Drax has to crash land on a moon. Space problems. After trekking for some time, on a desert looking planet, he comes across a bar. He’s looking for a mechanic. Who he does find, is Terrax! Who I mostly only know from his time as a Herald of Galactus. Not a bad issue, and I’m super cool with just buying the first issue of storylines but I doubt I’ll be following this series. 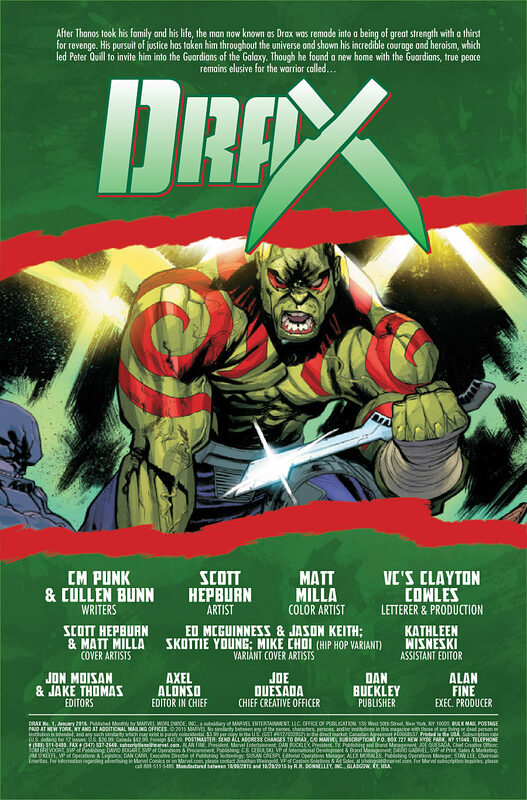 Unless Drax wishes he had a teammate with him (and name checks Kitty) but I doubt the spinoffs titles are going to have storylines that end with the team showing up and resolving the situation.